Set the tone for your wedding. Skip the headache. Let’s design beautiful, meaningful stationery, worthy of your romance. Together, we’ll get your loved ones excited to dance the night away with you, right at their mailbox. I incorporate calligraphy, illustration, painting, and digital elements to make your bespoke, printed pieces shine. Trust me – your closest people will make their “OMG” faces in their driveway. Invitations are an amazing way to set the tone, but they’re just one piece of the puzzle. My goal is cohesion across every element for you – so your save the dates, invitations, and day-of-wedding materials all coordinate and fit into your overall vision. Your guests will recognize this thoughtfulness when items fit together – this is event branding in action. What’s event branding? Why should you care? Think of every brand you love. You know the font of the Anthropologie logo, but you also know how amazing the store smells when you walk in, how whimsical their merchandising displays look, and how funky their detailing can be on the clothes. The Apple logo is also recognizable, and everything else also fits together: its product line, retail stores, and commercials. Your wedding is no different. Your love story is one of a kind. Let’s tell that story in a special way, to give your guests a sense of cohesion and deeper meaning across elements. Stationery is the perfect way to fit all the pieces of the puzzle together, giving unity to your overall design through color, writing style, and artwork. Custom invitation design can feel overwhelming, but I promise – it’s just a matter of knowing your options! If you’re not sure about paper types, print methods, and extras available to you, purchase a paper sample kit. These kits showcase and explain tons of options – and when you book with me as a custom design client, the cost of the kit will be credited to your overall order. It’s a low-risk option to learn more. Purchase yours HERE. Full-service clients typically dedicate 5-7% of their overall wedding budget to their handcrafted paper goods, including save the dates, invitations, and day-of-wedding items. Overall budgets vary greatly, depending on print quantity/method and items desired. To provide the level of service my clients have come to expect, my minimum investment for custom design is $1,800.00. 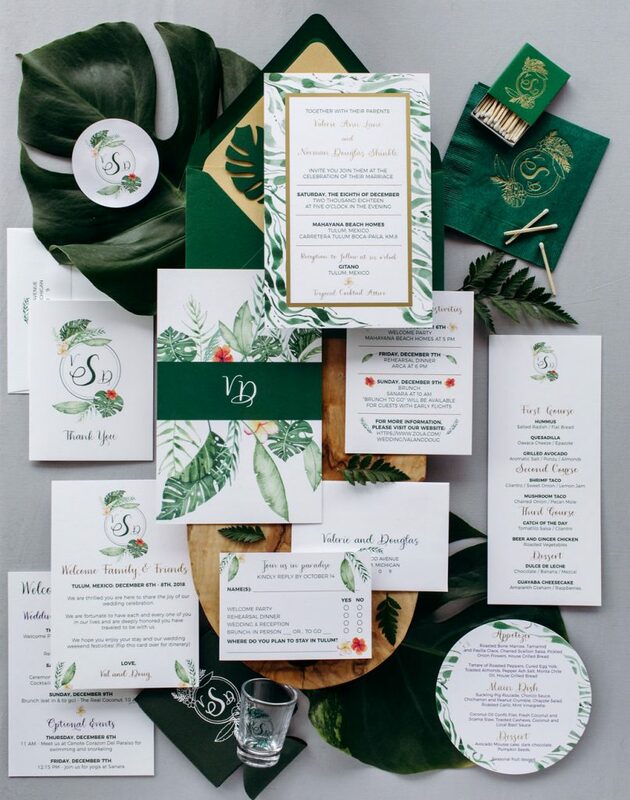 The average Leah E. Moss Designs client spends between $3,500.00 – $6,000.00 for complete design services, achieving a uniform aesthetic across all stationery and other printed elements with one vendor (save the dates, invitations, and day-of-wedding items). As an added bonus, I make a donation to Detroit Dog Rescue for every custom client who books with me. You’re supporting a small business, and this small business owner is supporting her community, too! Here’s an overview of our process together. I’m already excited! After you reach out, I’ll schedule a complimentary consultation with you. It’s like a coffee date, but as a video chat. 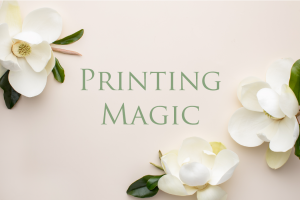 All printing methods are available to you – digital, metallic foil, or letterpress are all options, and I will make recommendations based on your budget and aesthetic goals. You’ll get an itemized estimate from me with a custom quote and timeline based on our discussion. We’ll review this together during a second chat, so you can answer any questions in real time. A deposit holds your spot on my production calendar – then we get the paper party started! Any artwork included in your invitation is created from scratch. There are no cursive computer fonts or clip art used – everything is done by hand in calligraphy and/or watercolors and digitized. I provide you with a pencil sketch as a proposed concept of all the artwork and calligraphy styles to be included in your designs. With your blessing, I put together a first draft and we go back and forth with tweaks to move toward a final version. Two rounds of edits are included as part of the process because this is a conversation… two way street! All proofs are presented in true-to-life sizing, for easy review on your part. You approve the final proof and we’re off to the races. We’ll have a final production discussion to make sure everything is all set in terms of quantity and details before your invitation heads off to print. I take care of all the printing for you. It’s basically magic and you’ll have a box of pretty at my studio to pick up, or waiting for you at your doorstep – pixie dust included. I also take care of any extra goodies we’ve dreamt up for you: envelope calligraphy, wax seals, ribbons, vintage or custom stamps. Dreamy. If you want, I can also help with assembly – white glove style. Easy. You get them out in the mail. Your loved ones go B-A-N-A-N-A-S in their excitement. You wait for the RSVPs to come back with serious anticipation. Cue your happy dance. Mine is a shimmy that’s more like a full-body wiggle. We’ll repeat this process for each “phase” of our time together, from save the dates to invitations, to day-of-wedding details. I can also help with printing for lots of non-stationery items for the big day, including cocktail napkins, kippot, coasters, stickers, matchbooks, and other fun items you may want to incorporate for your guests in a cohesive, thoughtful way. That’s all good, but I’m sure you want to see some pretty! Reach out here for your complimentary consultation. Let’s get this paper party started!